In the 1970s, policy makers were concerned by how wage rises were fuelling cost-push inflation. When wage stagnation emerged in Japan following the collapse of its asset markets in 1990, it was greeted as a novelty and elicited comparisons with the 1930s depression. Several economists suggested deflationary conditions in Japan occurred only because the government did not commit to sustaining monetary and fiscal stimulus. Given the lessons from Japan, policy-makers coordinated to sustain aggressive fiscal and monetary stimulus in several economies in an attempt to decisively break the grip of debt deflation. In particular, Japanese stimulus policies explicitly targeted overcoming wage stagnation as the key to reviving its economy. But the aggressive policy stimulus barely nudged the needle on wage increases, even as economic growth recovered. There are multiple theories to explain why wages won’t go up. Every theory has some element of truth but none brings us closer to solving the mystery of overcoming wage stagnation. We need to be able to distinguish the forest from the trees as erroneous policy beliefs can cause resources to be misdirected and is costly. In this context, there has been constant exhortations to deploy fiscal and monetary stimulus, boost manufacturing, restrict imports and immigration and rebuild the middle class and trade unions. But even when these policies are implemented, they do not seem to have much impact on wages. In fact, wage stagnation occurs even in economies operating near full employment. Others advocate linking wages to productivity growth but the evidence is that productivity gains have not flowed proportionately into wages. At the moment, the most rigorous tool for analysing wage stagnation is the labor market monopsony framework. This theory postulates landscape changes (e.g. concentration) increased monopsony power and enabled employers to dictate wages and terms. Labour monopsony theory predicts “firms with monopsony power have an incentive to employ fewer workers at a lower wage than they would in a competitive labor market. What the monopsonistic firm loses in reduced output and revenue, it more than makes up in reduced costs by paying lower wages. In other words, by recruiting less aggressively, paying less, and sacrificing some employment, employers with monopsony power can shift some of the benefits of production from wages to profits”. This illustrates a point in my earlier article that price (such as wages) formation tends to reflect the outcome from competitive strategies rather than from economic efficiency. The logical conclusion from labour monopsony is that wage stagnation can be addressed through improving labour bargaining power. In connection with this, policies are proposed to strengthen labour’s bargaining position or to counteract the bargaining strength of employers such as through labour enforcement, antitrust regulation or the break-up of monopolies. Josh Bivens, Lawrence Mishel and John Schmitt points out theories based on competitive labour market models or concentration may not fully explain wage stagnation or inequality. They note that “assessing the role of market concentration in the growing pay-productivity gap is equivalent to assessing how growing concentration affects increasing compensation inequality and the erosion of labor’s share of income, as these are the two channels through which increased productivity can bypass the pay of typical workers”. Josh Bivens, Lawrence Mishel and John Schmitt posits “this rise in the relative market power of employers might owe less to growing market concentration or labor market frictions and more to the collapse of policies and institutions that buttressed the relative market power of workers…It may have always been the case that American labor markets are concentrated…this concentration…puts downward pressure on wages…It may also have always been the case that…low-wage labor markets are riven with frictions that…give employers the power to set wages. But in previous decades, these always-and-everywhere sources of employer market power were likely neutralized by institutions and policies that provided countervailing power to workers. In more recent decades, several of these institutions and policies have been eroded or rolled back, with nothing to replace them as sources of countervailing power”. In this regard, Josh Bivens, Lawrence Mishel and John Schmitt point out “macroeconomic policy has failed to secure full employment for the large majority of these years. This has led to labor markets with too much slack to allow low- and moderate-wage workers to demand and achieve consistent wage gains. The evidence is quite clear that low- and moderate-wage workers need lower rates of unemployment to post wage gains than do their higher-wage peers”. They add that “other bulwarks of market power for typical workers (labor standards, broadly defined) have also eroded in recent decades. The most prominent example is the federal minimum wage, which in inflation-adjusted terms is now roughly 25 percent lower than it was at its height in 1968, even though productivity has nearly doubled and low-wage workers have become far more educated”. “For middle-wage workers, the key labor standard that has eroded is collective bargaining”. In addition, “growing trade flows from lower-wage nations led to a collapse of worker-side market power” and combined with concentration to result in wage losses. Josh Bivens, Lawrence Mishel and John Schmitt also note that “given that frictions can reduce workers’ ability to find alternative employment, it is no surprise that some employers strive to create such frictions…employers have pursued an aggressive host of practices meant to limit workers’ bargaining position, and policymakers, particularly through the blessing of case law in the courts, have often ratified these practices. Examples of these employer practices include mandatory forced arbitration agreements, noncompete agreements, and nonpoaching agreements”. My view is that while there are merits to labour monopsony, it has the drawback of being subconsciously tied to an industrial economy. Therefore, it is unable to take into consideration the dramatic changes in the nature of production, consumption and the organisation of work. In this context, the varying theories on wage stagnation can be interpreted as a manifestation of the information effects altering the relationship between aggregate demand and wages. Several theories are based on behaviours associated with the information effects. The Winner-Take-All (WTA) explains how competitive bidding for talent results in a few highly-paid winners but leaves a large number of workers willing to work for low wages. The fissured workplace explains how new organisational flexibilities and technologies increases the substitutability of labour, eliminates overhead labour costs (benefits, idle time) and allows firms to avoid locking in labour at high costs. The new organisational flexibilities also enable firms to fragment work into smaller pieces at cheaper prices and to contract labour only on a need basis. Zero marginal costs suggest the IoT will lead to a dramatic reduction in marginal costs of production (which implicitly includes labour costs). There are also overlaps with the concentration and superstar firm theories. The existence of industrial-era organisations (with hierarchies and large numbers of employees) is being threatened by the emergence of the information-based business models. Globally-scaled firms with few employees have enjoyed tremendous success while the traditional firms with a large number of permanent employees on high salaries are vulnerable. Organisational flexibility is complemented by financial (information) flexibility. Corporate restructuring or share buybacks are an alternative to headcount expansion. This means management have more ways of increasing their share price without having to raise wages. This has led to a decoupling in the relationships between share prices and wages. Wage stagnation mostly occurs in matured economies which are high-information environments. Developing economies are subject to cost-push inflation dynamics because of their lower wage base. But the cost-push inflation dynamics seems to have dissipated in matured economies; probably because labour work can easily be sourced from lower-cost locations abroad. In matured economies, economic growth does not automatically lead to higher wages. Hence, the stubborn resistance of wages to aggressive policy stimulus is likely due to landscape change. 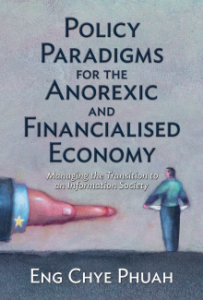 When economic activities are increasingly intangible and information driven, it changes the complexion of challenges from one of managing output constraints to one of managing information and of addressing income distribution bottlenecks. The Council of Economic Advisers. Phuah Eng Chye “The sharing economy: A futuristic taxi landscape (Part 3: Pricing fares the same way as stocks)”. Measures as outlined by the Council of Economic Advisers. 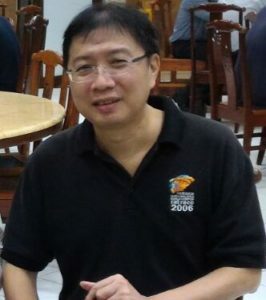 Phuah Eng Chye “The significance of information effects”. Phuah Eng Chye “The services economy: Revisiting Baumol’s cost disease”.